One of the biggest trends right now is “leveraging” or “scaling” RPA’s reach by adding cognitive elements to the process. Those under pressure to do more with less are keen to tap into new levers to drive automation’s impact further. One of those levers is cognitive automation. Nadin Kraus from Teva Pharma, expert speaker at the AI & RPA World Summit 2019, elucidates why you should have an eye on this trend. Read the full report. Cognitive enables RPA to continue and expand via two critcal steps, what are they? What types of cognitive solutions are vendors focusing and rapidly advancing on? How has combining machine learning with bots helped to analyze data? 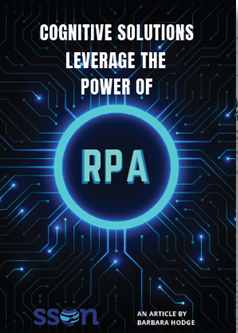 How to overcome challenges faced when RPA fails in a business contect?